We have had a great time since we left Alice Springs. Big rains were coming when we drove out of the town. Then in Uluru it poured all night. As I lay in bed I thought of the water rolling down the face of the rock and filling the little waterholes around it. In the olden days that would have meant fresh water for the people and their dingos like me. We got bogged in Port Augusta. Dad drove off the road to sleep for the night and then reversed into slushy clay. We couldn't move and it was raining. He tried to dig us out and I stayed in the car and helped by barking at the wheel. We gave up and both slept in the back even though the car felt like it was sinking. I had my head on Dad's leg for the whole night. Last time we did that was when we were sleeping in the rain in a swag. Dad let me crawl in. 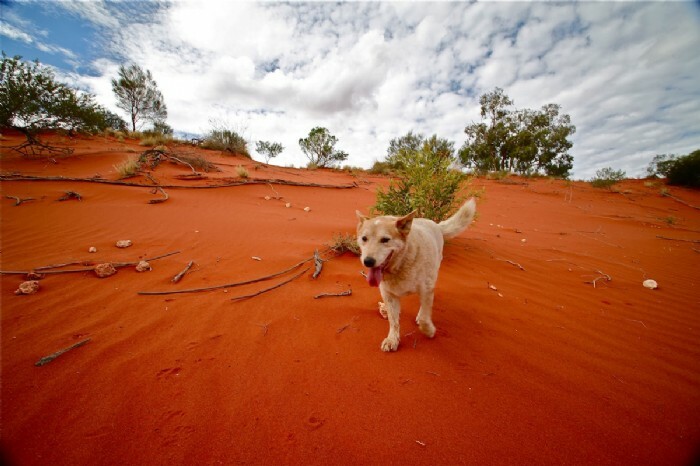 Old Mavis tells us that aboriginals used to measure how cold it is by how many dingoes they slept with. One dingo meant it was cold. A five-dingo night was freezing. Anyway we got towed out the next morning. We even had to drive through a swollen river at Ebenezer Roadhouse. People were queued up either side and frightened to go through. We weren't because we had the Toyota and we are brave and they all cheered me because I had my head out the window. We stopped in a town called Renmark on the Murray River. Dad threw a stick into the river and a black kelpie swam after it as well. Now we are in Hay and can't leave until the water goes away. The locals say the Murrumbidgee River is going to rise in a couple of weeks. People upstream from Hay in Wagga Wagga have already had to leave their homes. Dad and I might have to drive home all the way around to Albury and then back to Sydney. But that's life on the road for Dad and me. I think I am writing better now. I am not so nervous. Thank you for reading about our trip. I love you Tommie - I was just reading the bit on the weather temperature test and the number of dingoes to a colleague - you have to read at least 1 funny thing a day when you are practising law - it helps you get through the day! Hope you are well. Hi Alice. I am glad you are reading it. You and I had fun on the Ilpurla Trail didn't we. woof Tommie. Hi Tommie! You are doing a great job taking care of your dad. My mum has taken off and left me in "care" cause she says I can't go to Writers' Week. But look, here we are writing! I think she's a bit full of herself and she's definitely not as much fun as your dad. I wonder if I am being punished for something. I keep thinking back over what I did last week. I only dug a few holes in the lawn and I pulled some things off the clothes line but hey, they were in MY yard and just dangling there too long to avoid temptation. Anyway, if she thinks this will stop me expressing my displeasure when she's away too long she's got some more to discover when I get out of this place! Good luck with the trip and hope you have a safe one whichever direction you go.